The dream environment looks a lot like this picture, except snow, lots of snow. My recurring dream begins with me travelling to Alaska to give a talk to the locals about dream interpretation. The dream is the “serial” variety that continues a story from dream to dream like sequels to a movie. Initially, I find my way to the small Alaskan town, and just know it’s north of the Arctic Circle. The dream makes a point of telling me that fact — or more accurately, I tell myself that in the dream, reflecting my subconscious knowledge of the meaning of the symbolism — and I use it as a clue for the interpretation of the dream. At first though, I am puzzled by it — by that detail in particular, and the dream in general — and by some of the details such as the fact that I see a man on the street selling small items on a folding table. ‘Connect and reflect’ is the process I use to understand this recurring dream, with a big clue provided by an association with Alaska. My first book is an intro to the three steps of dream work: remember, interpret, and live your dreams. First, I connect the dream-story and the role I play as “dream teacher” to what’s happening in my life at the time. My first book about dreams, Dreams 1-2-3, made a small but noticeable splash in the publishing world and my publicist suggested that I use it as a calling card to schedule speaking engagements. I called every bookstore, library, and community center in my area to offer my services, and the reception was enthusiastic. Great! I’m on my way to reaching a big goal in life to teach dream interpretation. That part of the dream is easy to understand once I connect the role I play in it with a role I play in my waking life. I teach dream interpretation – how much more obvious can it be? Not obvious enough for me at the time. I still didn’t understand the detail about being in Alaska, or why the audience was small. I didn’t see the big picture. But, again, connect together the details of the dream and reflect on your life, it leads to the meaning. The missing piece of the puzzle is my association with Alaska, and it came to me one afternoon while doing yard work and thinking about the recurring dream. I asked myself, what do I associate with Alaska? Decoding the symbolism of a known place used as a setting in a dream begins with thinking of common and personal associations with the place, such as Vegas being associated with gambling and raucous behavior, and Paris with romance and intellectualism. I really should have performed this step first because making associations with dream details is the #1 tool used in dream interpretation. I’d grown a bit lazy though and skipped steps, or maybe I just wasn’t ready to understand the dream till that time. An answer came to mind almost immediately. I associate Alaska with a region that’s sparsely populated, especially north of the Arctic Circle. The association connects for me why the audience and Alaskan town in the dream are small and the dream makes a point of bringing it to my attention. I’d been doing the rounds as a public speaker and sometimes the audiences were small. A single, solitary person attended my first dreams workshop. Soon after, three people attended a talk I gave at a community center. Usually, the audiences were bigger, but some were pretty darn small and it discouraged me. I pumped loads of work into those engagements and felt like the reward was too small in terms of selling copies of my book and gaining name recognition. This reflection of my life shows in the dream detail featuring a street vendor selling items displayed on a folding table. At my speaking engagements, I often put my books for sale on a display table. The big picture comes into view for me as I use the association of “sparsely populated” to decode the rest of the dream. At the time of this recurring serial dream, I might have stopped taking every speaking opportunity. Same goes for media appearances – I did dozens of media interviews and sometimes the audiences were small, even “tiny.” I asked myself, are those small appearances worth it? Should I screen more closely and focus my effort on the highest payoff? I give dream interpretation workshops at bookstores, spas, libraries and community center — but never in Alaska. However, I’d be happy to do it. The answer is found in the dream. I’m there in Alaska, at the cozy, warm bookstore, and see the small audience that’s gathered to hear me speak. How do I react? I think to myself, I’m here so let’s make the best of it. Plus I love teaching dream interpretation and these folks really seem interested. The environment feels welcoming, and I feel good about being there. 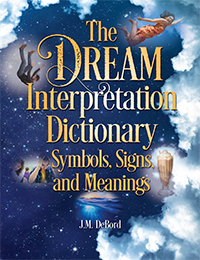 With those insights in mind, I decided to continue plowing forward and taking every opportunity to do what I do best: teach dream interpretation. Come one, come all. That decision reaps unexpected rewards as I hone my skills as a speaker and live the role I want to play in life. Understanding this recurring dream helps me to see the big picture of my life and career and to keep walking the path. My audiences are growing, my reach is extending, my books are selling, and my name recognition is expanding. I’m getting to where I want to be, and I credit that dream with helping to make it happen. At that juncture in my life I might have changed how I conduct my business, and who knows how the ripples of that decision could have impacted me later. Recurring dreams tend have important messages. They can show you things you urgently need to know, address, or change. They can provide perspective of your life and a retrospective of where you’ve been, where you’re at, and where you’re headed. Even day residue dreams that recur can provide valuable insights, especially for self-discovery and -knowledge and tracking patterns — and breaking them, if necessary. You always see something about yourself reflected back in your dreams. In recurring dreams, the reflection can be clearer and fuller, with more context and detail to fill in the picture. You know if a dream recurs that the dreaming mind is purposeful about it, so you work backward from that premise and ask why. What is the dream trying to show or teach you? What’s the lesson? Unless the dream imagery is day residue that passes by your attention with little notice, you know that recurring imagery and themes are a big neon sign asking for your full attention. I encourage you to use the comment area below to tell me about your recurring dreams, and to use what I share here as inspiration to closely track and ponder your recurring dreams and dreams in general. You will enjoy the fruit of this labor. It will take you to unexpected places in life, and like me in the dream visiting a small Alaskan town, they are places where you belong.